MommaSaid | THE HAPPIEST MOM: Quit Your "Busy-ness" Moms! Browse: Home / 2011 / October / 27 / THE HAPPIEST MOM: Quit Your Busy-ness Moms! THE HAPPIEST MOM: Quit Your Busy-ness Moms! Up until that moment, I really hadn’t thought about it in that way. But suddenly I realized that, yes, I had been bothered by it for some time. Trying to make plans with certain friends or asking other moms I knew how they’re doing often turns into a detailed itinerary of all they have to do this week. “Well, I’m fine,” they’ll say with a heavy sigh, “but you know, I’m so busy. The dog has to go to the groomer, the van has a leaky tire, we all have dentist appointments, and the kids have soccer, violin, and fencing. I think I’m getting a cold so we’ll probably have to add a doctor visit in there. And did I mention that my husband is working late three nights this week and I have to make dinner for my sister-in-law, who’s visiting from Ohio? I guess I’ll have to put aside the whole afternoon to clean that day, too.” (more heavy sighing). Honestly, by the time they get to “groomer” I’ve already glazed over. There’s little in life more boring than listening to a full-on play-by-play of the scheduled minutiae of another person’s life–heck, mine is boring enough that I can barely pay attention to my own calendar. But we’re all guilty of boring our friends at times, and I’m certainly no exception. What really bothers me isn’t just that trying to convince somebody else how busy you are by listing every single thing on your to-do list is boring. It’s that anyone would feel compelled to try to convince somebody else how busy they are. Not just once, but over and over again. And the people in question just seem so unhappy about being so busy. There are some mothers I know who claim to be so chronically over-run with items on their to-do list that I sometimes wonder: how is it even possible to have so much to do, not just sometimes, but constantly? If you were unhappy with your level of busy-ness six months ago, why are you still at that same level? I asked this question on Twitter and received an onslaught of responses from fellow Tweeps who are tired of hearing friends and family complain about the busy-ness they seem to willingly choose to engage in. “It’s beyond annoying. We’re ALL busy in different ways. GET OVER IT.” wrote @bessieviola. “I think there is also some ADHD and fear at play – like we think downtime isn’t allowed whether w/ work or kids,” wrote @travelsavvykayt. Of course, many moms argue that they aren’t able to scale back their lives. The teeth need cleaning. The kids’ minds need stimulating. The dog needs grooming. But when you start each week with a feeling of burden over all you have to do, week after week after week, maybe it’s time to figure out what you can cut out. Kids don’t have to be involved in multiple organized activities year-round. The average dog doesn’t have to look runway-ready. You don’t have to entertain all the time if it stresses you out. The fact is, we’re all busy. Sometimes, I’m busier than the mom next door; sometimes, she’s busier than me. Why waste time hashing out exactly how much we have going on—we’re too busy for that, right? But what I’m also sensing is that “I’m-so-busy-itis” is less about how busy a person actually is, and more about how she wants to be perceived. If we sigh and moan about how much we have on our plate, we think it “proves” our worth as a mother, wife, PTA member, career woman, volunteer, or all-around overachiever. After all, if she’s able to, say, volunteer at the school even though she’s so busy, a mom must be some kind of Supermom or saint. And often, the “I’m so busy” speeches seem to imply “I’m busier than you,” as though moms need to prove that that we’re putting in even more effort than the woman next door. As Kristen pointed out, some seem to think that being chronically busy earns them the respect, or awe, (or maybe just pity) of others. Ladies, let’s knock it off. All this constant “I’m soooo busy” one-ups(wo)manship is disingenuous. It’s unbecoming. It’s not making anyone out to be a hero. And most of all, it’s boring. I’m not saying don’t vent when you’re feeling overwhelmed: everybody needs to unload from time to time. But examine your motives: if you never do anything to improve your situation, if your “vents” are really just “aren’t I super-spectacular to take all this on” in disguise, it’ll show. And annoy. I guarantee you that rattling off your to-do list to anyone who will listen isn’t earning you respect, and it isn’t making you any happier. 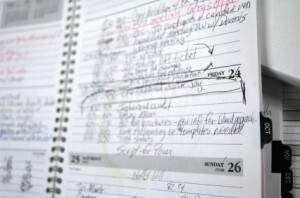 If you’re dissatisfied with your level of busy-ness, see what you can change. And if you can’t change anything, consider that the person you’re talking to is probably just as busy as you….so busy, in fact, that she wishes you’d stop talking about how busy you are so you can both move on to more important things. Like enjoying the free time you’ve got, however fleeting it may be. As a mom of five and blogger, author and writer, Meagan Francis spends the bulk of her time trying to balance kissing boo-boos with meeting deadlines (sometimes doing both simultaneously). But while life with kids is often chaotic and frustrating, Meagan believes a mother’s life can be rewarding and fun—and that all moms deserve a little more happiness. Her book The Happiest Mom: Ten Secrets To Enjoying Motherhood, was published in partnership with Parenting magazine in April. Love, love, love this! Gosh, if we all stopped automatically doing this, we might have time for a walk in the park!